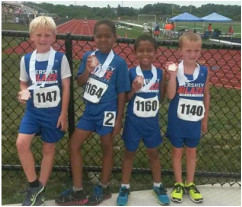 As members of the Mid-Atlantic Association of USA Track & Field, the Hershey Blaze are prepared by caring and experienced coaches and volunteers to compete with some of the best young athletes in Pennsylvania, Delaware and New Jersey. But we don't just stop there- Hershey Blaze athletes have also competed with talented young people from all over the country. Our club provides 2 seasons to compete in track and field. The primary season is our outdoor program (Late March-Aug) which begins in the Spring extending through the summer as athletes progress through some of the championship events. The first half of our outdoor season is our Blaze Future Stars Program and Preseason. Through our Blaze Future Stars Program we promote the development and interest of younger athletes ages 14 & under through partner recreation sites and local teams coordinated by our organization. Following our Future Stars Program and Preseason we transition into the competitive/ championship season where the competition schedule becomes more intense and the true development starts to shine. During this time our older athletes who participate in high school programs begin to join in and attend meets as well. Blaze athletes are consistently competing alongside some of the best young talent in the nation. either season is not mandatory- athletes find themselves more prepared and in wonderful shape year round. Most importantly, they are making new friends. National team has no set guideline for registering but rather holds a higher standard of dedication of athletes who register. The National Team designation is for a group of top performing HBTC athletes who intend to represent the club at the USATF Youth Outdoor Championships, AAU National Club Championships and/or National Junior Olympics. One of our goals is to have athletes represent HBTC at the National Level whenever possible in every age category. This group consists of athletes of all age divisions with the ambition, work ethic and commitment to succeed at the national and international levels. National Team is announced each year at the start of the championship outdoor season on June 1st. However, an athlete may be selected at any point during the year should they achieve any part of the selection criteria. National Team is also open to non Blaze members who have an interest in joining the club for the National Club championships only. Interested athletes should inquire with the club leadership for details. 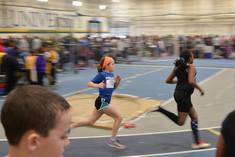 Our program is designed to introduce kids to sprint and distance running and field events by providing an experience that is fun, competitive, social and informative about the sport. While we do not always have equipment to train for all track & field the events, Hershey Blaze athletes compete in many of the events listed below depending on the meets we are attending. This is our training session that lasts from 8-10 weeks and is designed for training and exercise during the winter months. Some athletes are introduced to Hershey Blaze Track during this time and are able to compete in Indoor Meets sanctioned by USATF. The Meets are highly competitive and provide our athletes a wonderful challenge as they work to improve. These meets take place on indoor tracks ranging from 160-200m.